Both comfortable and stylish, the Nelson 65 design features a repeated white motif print of Japanese pagodas, cranes and bonsai trees for a stylish lounging essential. This subtle print features across the lightweight fabric base for a modern, downtime essential. 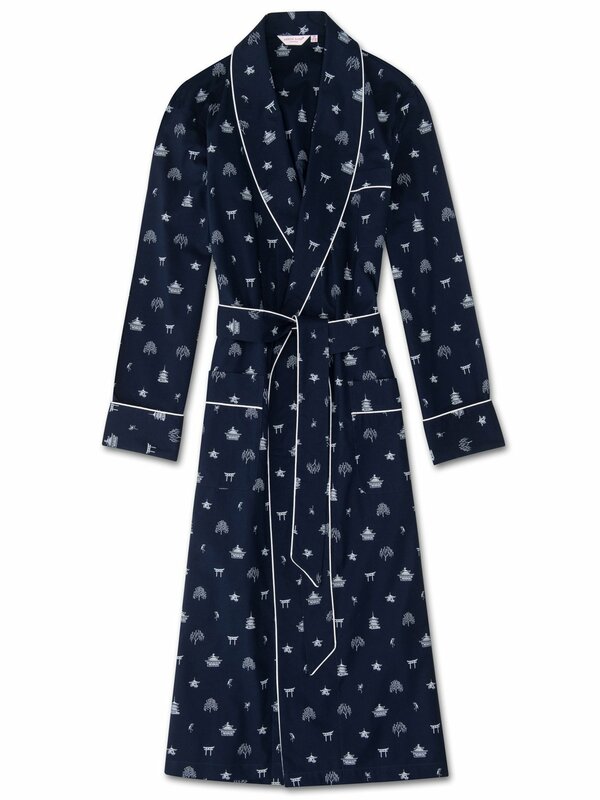 Made from our signature navy cotton batiste, a light and soft fabric that excels in warmer conditions, the Nelson 65 dressing gown features a classic shawl collar design with a breast pocket and two front pockets for practicality while around the house. The gown is also complemented with white piping and a self-fabric tie-waist for an added touch of luxe. For the man who likes to lounge in style, our signature dressing gowns merge classic styling with modern fabric designs. With its relaxed fit, you can layer this gown comfortably over pyjamas or loungewear even in summer.